From Genghis Khan to Alexander the Great, any good general knows that war is all about territory. 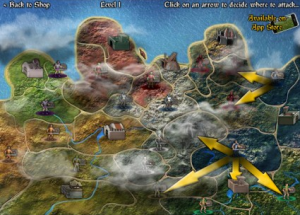 That simple premise is the basis for Warlords 2; capture and annex your enemy’s lands is the key to success in this surprisingly compelling online game. But it’s not as easy as just charging in and taking control. Skill, tactics, and experience are needed to ensure victory. 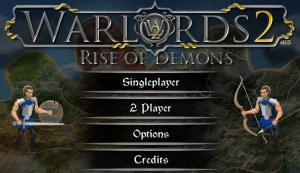 Warlords 2: Rise of Demons is the sequel to Ben Olding’s hugely popular original, and is available to play free online at armorgames.com. You can sign up to enjoy advertising-free gaming or just get straight into the action with a click. The game is set in the land of Beneril, to where the brief intro over a stylishly hand-drawn scene tells us ‘War is coming, it’s only a matter of when’. Beneril is under threat from the demons of the north, which are bringing giants from another dimension to their campaign, causing the various tribes of the land to wage war amongst themselves. It is this war into which the player enters. Human Alliance: With their superior armour. High Elves: Resistant to magic but also good at it. Orcs of the North: Powerful and well trained. Wood Elves: Fast and light. Orcs of the South: With chopping weapons. Undead: These guys have diseased scythes! Men of the West: Swordsmen. The setup is simple. Once you’ve chosen your army you decide which of your neighbours to wage war upon. 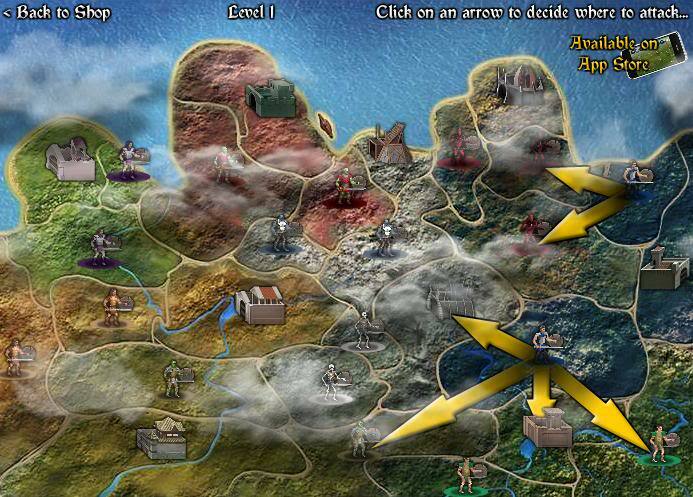 Before you click on your target, you’ll be given a difficulty rating that starts low, only 5% for the first battle, but rises as you move on to other territories. The in-game prompts are useful too, suggesting that you might need siege units or ladder men if you’re to attack heavy fortifications – Genghis would have known that! When you get down to battle, the object is to get your troops over to the other side of the screen, while preventing the enemy’s from reaching yours. 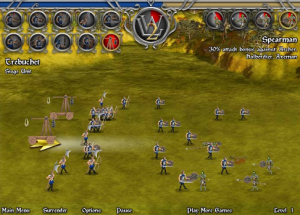 Use the up and down arrows to decide where to deploy your men and the left and right keys to select a unit – archers, swordsmen, spearmen can be deployed by the spacebar to counter whatever your opponent sends out. It’s sometimes worth the risk of sending out a long-odds unit, as they’ll pick up bonuses for winning. But you do have to wait for the unit’s timers to be ready when the arrow turns yellow. After enough kills, a meter charges up that will eventually allow you to release a mass attack in every row, simply by pressing Q. Far from an immersive environment, the graphics might seem either dated or cutely retro. However, that doesn’t affect enjoyment of Warlords 2. The pixel-inflicted characters are more than sufficient to keep your interest, and the way heads come off to a swinging axe is still rather satisfying. Once your campaign begins you might find it hard to tear yourself away from it, but that’s what great generals have – dedication!